This post is a mobile devices special edition. As we all know, students will always have their mobile devices (cell phones, iPods, etc.) with them, even if they are banned. This can be a good thing when used properly. This post will focus on some tools that will allow you and your students to become more productive with mobile devices. 1. TextMarks - TextMarks is a group text messaging service. There are many possible uses for this service, from sending text messages that inform about homework assignments and upcoming assessments to helping to keep in touch with participants and parents of sports teams and other extracurriculars. There is a free portion that is ad supported that will allow you one free keyword to set up and 120 characters per message. If you want more keywords or no ads, you can upgrade to a larger plan. When you have your keyword set up, your students can subscribe by sending your keyword to 41411, wait for your message to be sent to them, then reply to that message with a "Y." Once subscribed, they could even set up the time that they receive the message every day, as long as you enable that feature in the setup. There are other services that do similar things, but TextMarks is one of the easier ones to work with. 2. PollEverywhere - PollEverywhere is an online polling service that allows for anyone to collect information from a group through polling using text messaging and web voting. PollEverywhere allows for an educator to sign up for a free account that allows for unlimited questions with 32 responses per question. Each question receives a code that matches up to only that question, and you can display the responses for multiple choice questions as a live aggregate of the answers or as a table to hide the results so you can get a true read for what your class knows or needs extra help on. If you wanted a more open-ended response, you can create a text poll, where students would respond with their own answer. For students without unlimited texting plans, you can set up your polls to allow for multiple responses for students to share their phones, or allow webvoting to allow students to vote through a widget you embed, a webpage with your question on it, or by using poll4.com to enter their quick response (also great with smartphones). If you want more plan options, the year-long teacher plan runs at $129 per year, or there are school building-wide and district-wide plans as cheap at $2.50 per student per year (minimum 200 students). 3. iPhone/iPod Touch (and other smartphones) - Of course, I would be remiss if I did not venture into the field of the smartphone. The iPhone really changed the idea of what a cell phone could be, and that idea was extended into the iPod, as well, with the iPod Touch. Of course, the iPhone is not the only smartphone out there, and the other ones also have apps available, but I am most familiar with the iPhone. If anyone would like to add to the discussion about other smartphones, it would be a great addition from a guest blogger. Imagine a student has the entire works of William Shakespeare available to them. At first, one might think that said student would have a really large book. Instead, an iPhone is pulled out and this student begins to read Act II of Hamlet. This student could do so anytime, anywhere, and the collection was a free download. Another student works with an interactive of the trigonometric function, while yet another is working with SAT test prep software. Between all of the free and paid apps, there are so many ways that a smartphone can help enhance your instruction. 4. Yodio - Podcasting has become a prevalent practice in education. It is a great way to include digital storytelling in the classroom. More students are able to share the information they learn and create, and teachers are able to get information out to their students in a more readily accessible way. However, many people believe that certain software needs to be available to them in order to create a podcast. With Yodio, you can create a podcast with nothing more than a phone and any computer with an internet access. First, you will want to set up an account at Yodio so you can start recording. Once your account is set up, you can call from your cell phone, record your audio (as one long podcast or as shorter chunks) which are then saved in your account. Once you are done recording, return to Yodio and create regular or enhanced podcast with photos you can also take with your cell phone. Yodio has even been trying to get a foothold in the education field, and if you contact them, they might be able to set up a plan to allow for you to obtain a number for your students to call to dump information into a central teacher account, as opposed to having each student create an account. Just imagine if you have students out on a field trip and want them to do some mobile reporting. You could give them the number for the central teacher account and have them phone in their responses at various points throughout the trip. When you return to the classroom the next day, you could have a class report ready to go and listen to as a class so all students can provide different amounts of information to a bigger idea (a great application of reciprocal learning, as we saw in the Classroom Instruction That Works book). 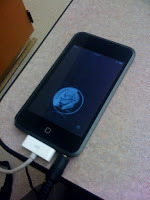 Of course, using mobile devices in the classroom is still a relatively new idea. If you are looking at using the devices in your classroom, start out small and make sure to have a structure for use set up, including consequences for misuse. Make sure students are aware of their own plans.